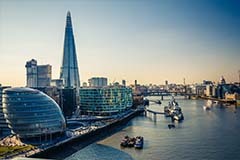 London is one of the world’s most visited cities with some of the best sights, attractions and activities. With our coach trips to London you can enjoy the delights of the capital, see the sights, shop or simply relax, whatever you choose, the capital has it all. 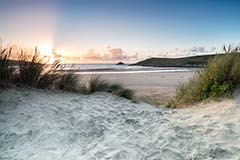 Discover a magnificent stretch of coastline made up of smugglers coves and sandy beaches, revealing the great variety of coastal towns and fishing villages with our great offers to Cornwall by coach. 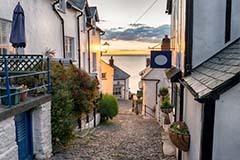 Coach holidays to Devon offer all the contrasting landscapes, medieval towns, moorland national parks and outstanding natural beauty of southwest England. 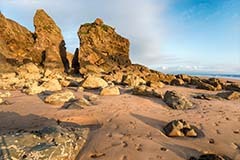 Search for coach holidays to Devon there is always something to discover here. 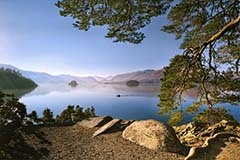 Be inspired by the landscape of the Lake District, the UK's most popular national park. Explore the beauty of England's largest lake with our coach tours to the heart of the Lake District. 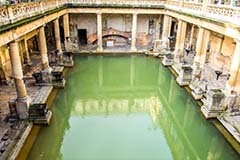 Visit the Georgian City of Bath with its many historical treasures, monuments and beautiful architecture dating back to Roman times. Designated by UNESCO as a World Heritage Site, the city has been welcoming visitors for over 2,000 years. Enjoy a break to Britain’s holiday capital, bursting with thrills, excitement and entertainment. 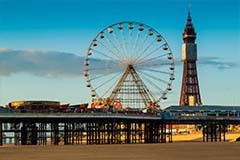 During Blackpool Illuminations you can be sure of a wonderful display that stretches five miles along the sea front. 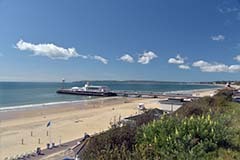 Discover the sunny south coast with seven miles of golden sands and sheltered waters, beautiful gardens, a variety of shops and restaurants and the lively nightlife of Bournemouth. 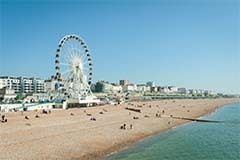 The city by the sea is surely one of Britain's most colourful, bohemian and vibrant seaside resort, famous for its graceful Regency buildings, the exotic iron-domed Pavilion. Walk around the Roman city walls of medieval Chester situated on the north bank of the River Dee. 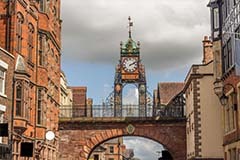 Chester is a classic, contemporary city with 2000 years of history. From the Victorian pier and three tier promenade, to a world-class marina, Eastbourne is both a classic and modern English seaside resort. 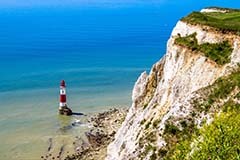 Sheltered by Beachy Head and the South Downs Eastbourne holds the record for the highest amount of sunshine in a month. Visit Falmouth, the main resort on the South Cornish Riviera. Situated on one of the largest natural harbours in the world, Falmouth is blessed with excellent sandy beaches. 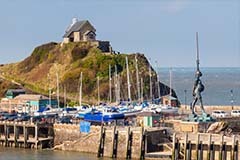 Ilfracombe is the perfect location for North Devon holidays. 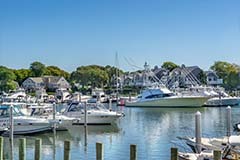 There are many fine and award winning beaches, from secluded coves to the wide stretches of golden sand and many bars and cafes to relax in. 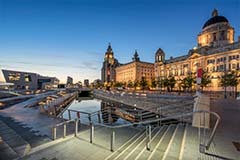 Enjoy the the perfect city break to Liverpool. A world famous city for its football team and rich musical heritage with the most welcoming atmosphere. Newquay is Cornwall's premier holiday resort and England’s favourite holiday destination. The beautiful resort of Newquay offers awesome cliff and beach walks, a picturesque harbour to explore and the variety of seaside activities. 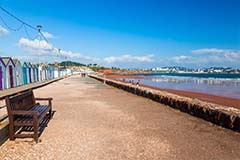 Paignton occupies the central part of Torbay and is a superb seaside resort with pier, harbour and miles of sandy beach, where many holidaymakers return year after year. 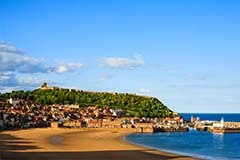 Scarborough is Yorkshire's premier holiday resort with acres of spacious gardens, cliff top walks, a colourful working harbour and plenty of things to see and do. It's the ideal place to stay for a short break. 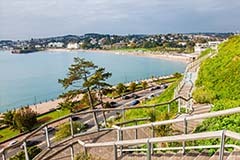 Torquay is one of Britain’s most famous resorts, situated at the heart of the English Riviera, with palm trees, exotic tropical plants & flowers, the bustling harbour, sandy beaches and unspoilt coastline. 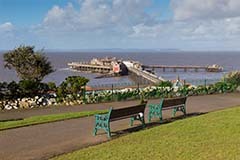 Weston-super-Mare a great seaside resort in Somerset, situated in a sheltered bay at the foot of the Mendip Hills with views across the Bristol Channel. Visit the World Heritage Jurassic Coast. 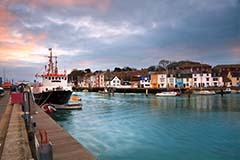 Weymouth is one of Britain's oldest seaside resorts, situated on the Dorset coast and surrounded by beautiful countryside. 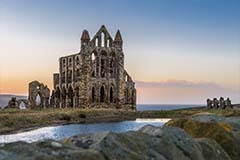 Historic Whitby is an ideal touring base from which to discover the delights of the North York Moors and the Yorkshire Coast, famous for it's connections with Captain Cook, and of course Count Dracula!